Funeral services were held privately for Carmille R. “Camille” Pasquale, who died on Sunday, December 30th unexpectedly at her home in Revere. She was 55 years old. Carmille was a lifelong resident of Revere and was an alumna of Revere High School, Class of 1982. Carmille worked as a sales clerk in Women’s fashion most of her working career. She worked for Fashion Bug and for the past 10 years at Rainbow Clothing at Northgate. She was also very dedicated to her family and was a caregiver for her parents. Carmille’s favorite past time was being surrounded by her loving family at holidays, birthdays and any other occasion when they were together. She is the devoted daughter of the late Concetta “Connie” (Penta) Pasquale & Anthony M. Pasquale. Loving sister of Michael A. Pasquale & his companion Nancy Pardi of Revere. She is the beloved niece of Michelina Pasquale of Revere. 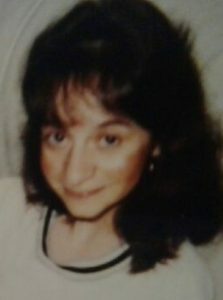 She is the cherished cousin of Stephen J. Pasquale & his wife Carla , Linda Guarino & her husband Michael, Gianna Pasquale , Michael A. Guarino & Tanner D. St. Clair all of Revere. Interment was private.